A Master Plan is an outline of the future development of an institution to ensure proper circulation, adjacencies and the ability to be able to regularly and reasonably renew the institution’s facilities. A Master Plan is somewhat like a plan for a cross-country trip. You need a goal, a budget, map, and a schedule. If you set out with a compass and no map, you can’t expect to find the best route. If you don’t budget for the trip, you could get stick halfway without funds to either complete your trip or return home. In much the same way, starting facility renewal or expansion without a Master Plan is an invitation to get lost. Yet institutions do it all the time—plan ahead without planning ahead. Sometimes they don’t have a master plan because they believe some widely circulated myths about Master Planning. Let’s look at some of these myths. Unless an Owner is working from a current Master Plan, then it is too late to start planning for an immediate project. However, it is never too late to start Master Planning. Though there may have been missed opportunities by not having a plan, there is no reason to perpetuate the mistake. A well-done Master Plan can prevent a mistake that could gridlock a campus or forestall reasonably priced facility renewal or expansion. A well-done Master Plan does take dedicated time. But the important thing to remember is that it’s never too much time. The calendar time is often the result of Owner availability, the accuracy and completeness of both the strategic and business plans, and the adequacy of the facility audit. The time, however, is necessary. If major shortcuts are taken in the development of the plan, then the plan may contain flaws that don’t appear until implementation. 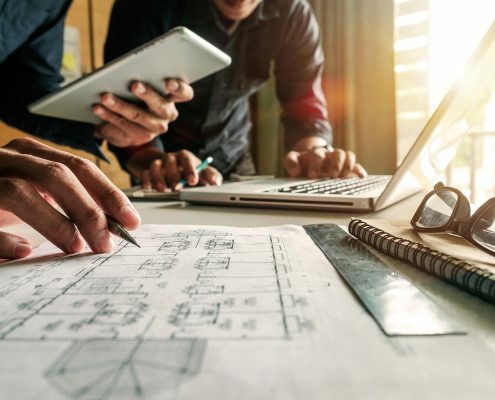 These flaws can be fatal, resulting in embarrassment, loss of credibility, cost overruns, the need for a new plan, or ammunition for those who say Master Planning provides no benefit. Though Master Plans are not cheap in absolute terms, they are an inexpensive investment in the future. This is very true when the cost of developing a plan is balanced against the cost of a gridlocked campus, or the cost of extraordinary measures that must be taken because project implementation was improperly sequenced. If either of these happens, then “expensive” acquires a new meaning. Of course, a sloppy or poorly done plan is a waste of money to begin with. A truly comprehensive Master Plan should include interviews of all senior administrators, key board members, key leaders (including Physician in healthcare facilities), all department heads, city/state officials, neighbors, and, when appropriate, customers. The department heads should decide who they would want to include from their respective areas. There is always a danger of raising expectations that all shortcomings will be solved in the implementation of the plan. It is the duty of both the Master Planner, Owner’s Representative, and, most importantly, Senior Administration, to make sure that it is absolutely clear that this is just a fact-finding mission and that there is never sufficient funds to solve everything. The process should be explained to the participants, including how the information will be vetted and how it will be prioritized. As long as communication is direct and honest, then expectations can be kept to a reasonable and manageable level. Time marches on, and needs and pressures change. Just as operational plans and financial forecasts become obsolete over time, so too do Master Plans. However, a Master Plan that is done correctly will be adaptive as changes occur. The Master Plan must be reviewed annually and at a minimum should have a five-year major review and most likely a ten-year overhaul. Obviously major changes from the plan’s assumptions would trigger a review or overhaul at that time. A full facility audit is essential to a Master Plan. One cannot plan for growth or renewal without knowing the present condition of the facility and the true costs of bringing it into code compliance along with an appropriate level of comfort and safety for everyone who uses the facility. Unfortunately, some administrators do not want an honest facility ‘report card’. All institutions carry some amount of deferred maintenance; however, it is risky to mortgage the facility’s future by annually underfunding facility needs. By having a full audit, institutions can then defer maintenance in a planned manner if they know what items will be solved by future projects and they have an approximate timeline. Moreover, Master Planning will help decision makers understand the challenges of introducing new medical, educational and information technology, which often require enhanced environments. Proper facility Master Planning allows an institution to allocate precious annual capital funds more effectively. While the audit may result in sticker shock, the information helps to provide a roadmap for logical proactive change as opposed to reactive, incremental and often poorly-planned (and therefore more expensive) last-minute facility updates. Myths aside, Master Planning is worth the investment of time and resources to provide institutions with their own personal “road map” to successful, strategic growth.